I'm a software architect by day and maker by night. Most of my making revolves around woodworking, electronics, and the combination of the two. I'm also the founder & president of NashMicro - the Nashville Microcontrollers users' group and the father of three future makers. Follow me on Twitter as @ianlee74 or for the most recent news on everything Gadgeteer, follow @gadgeteerin. 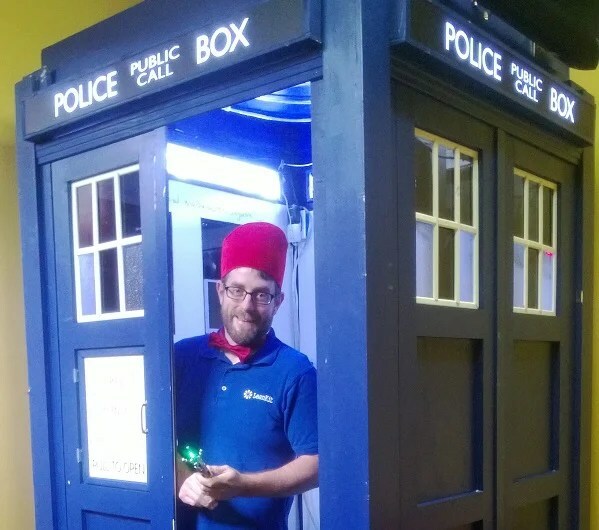 LeanKit CEO, Chris Hefley proudly shows off the employee-made TARDIS. LeanKit is your stereotypical software startup company in regards to growing rapidly and packing too many people into too small a space. Because of this rapid growth there was no place to go and have a private phone call. But, their CEO, Chris Hefley (wearing the FEZ), had a plan – a Maker plan! Instead of moving someone into storage room B, they decided to build a TARDIS private area. Although it was Chris’ idea, the construction of the TARDIS was a company-wide effort. The project started in February and was completed in August in time for a big unveiling at the Agile 2013 conference. The employees worked occasional half Fridays and a couple weekends to get it completed. They also kept a great build photo log along the way. It’s fun to see woodworking happening on top of desks normally used for programming! The construction is mostly plywood & pine on the outside and the inside is covered in whiteboard so that folks passing through [time] can leave a message. The inside is also illuminated with RGB LED strips which are attached to an Arduino based sound effects system that will play various Dr. Who sounds and visual effects at the push of a button. Chris Hefley does a great job explaining the electronics which Chris Gundersen assembled for the project in this video. Much of the artwork and design references came from tardisbuilders.com. Of course, since LeanKit is a maker of Kanban software for project management and their employees live and breath it, there had to be a Kanban board created to manage the project. Although the original idea of the TARDIS was to make it a permanent fixture in the office. They decided to build it in such a way that it can be totally disassembled and transported to conferences, Maker Faires, or a party on a bridge. Future plans include the possibility of making the TARDIS an entrance way to their conference room. Then, it truly will be bigger on the inside! More photos & videos of the final product can be found here. If you’d like to see the TARDIS, it will be on display at the Nashville Mini Maker Faire on September 21st. They are also sponsoring kits for the NashMicro booth where kids will be able to build their very own LED blinky “Sonic Screwdriver”.